I love breakfast. If you haven’t been able to tell from my site, we have such a large repertoire of breakfasts over here that my kids think Cheerios are just snack food and Rice Krispies are for putting in cookies. Oatmeal? Usually Bob’s Red Mill Steel Cut Oats, with dried blueberries, cherries, or fruit compote and a healthy teaspoon of delicious organic cream on top. Waffles? Multigrain or Belgian (yeasted), and always homemade. Crumpets, pancakes, oatmeal popovers, crepes, muffins, oh my! The obsession is shared by my kids and (happily) tolerated by my husband, but sometimes teeters on the dangerous side for its sheer amount of dishes for weekday mornings. That said, breakfast for dinner almost never appeals for me. Having done the sweet thing most mornings, and eaten my half bar of post-prandial chocolate, I want something savory and balanced. This dish, however, may break my rules because I have made it for breakfast, lunch, and dinner. A recipe almost does it too much justice for how simple it is. In fact, I post it at the behest of my good friend for whom I have made it at least twice. 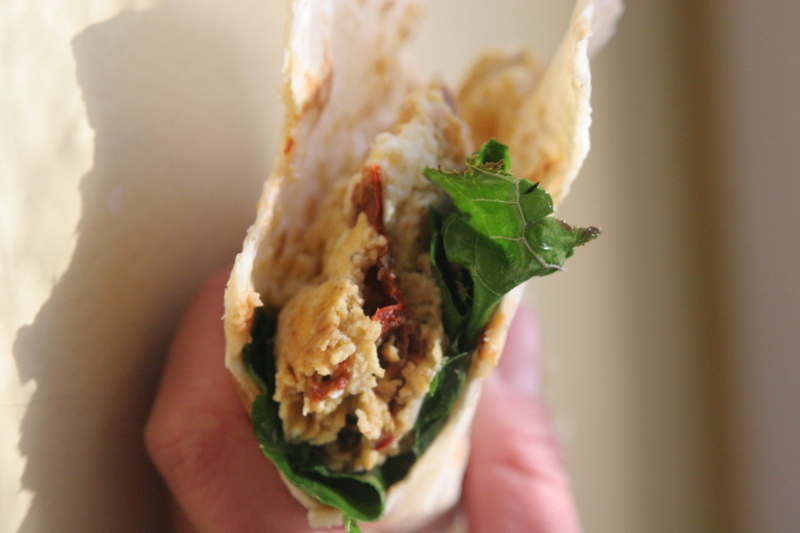 If you are like me and think that most things taste better nestled inside a tortilla or piled atop a piece of bread, you will love this. Just scramble together some eggs (I do 1 1/2 per person or 1 jumbo egg if I am alone), some Israeli feta and some roughly chopped/snipped chipotle peppers from a can. 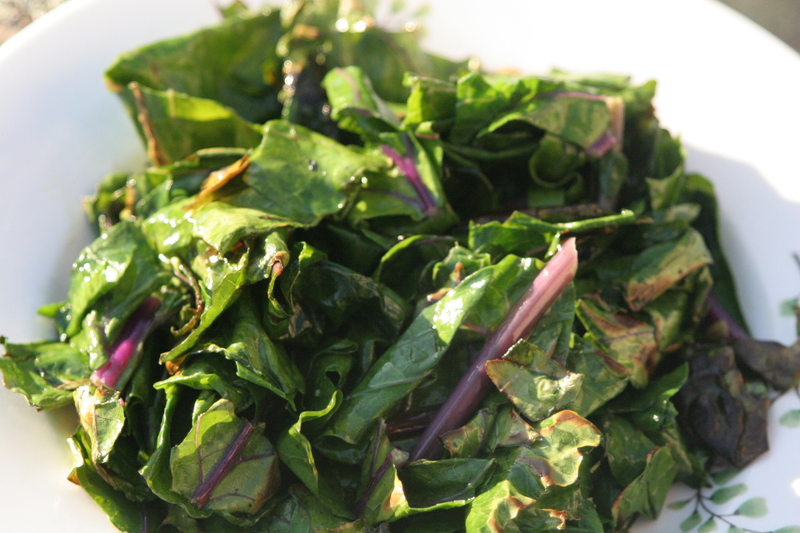 Take some cleaned greens (spinach, chard, beet greens, and kale are my regulars) and quickly fry them up with a tiny bit of olive oil. You want them to keep their pretty bright color. Remove the greens and cook your tasty scramble in the same pan. Serve on top of a warm tortilla or toasted bread. These savory and definitively not-breakfast egg tacos taste like so much more than the sum of their parts, largely thanks to the tangy and briny Israeli feta and the smoky chipotle chilis. And, yes, despite the tidal wave of food writers clamoring against recipes touting quick dinners, these take only a couple of minutes to pull together. I warn you, scrambled eggs with red chillies and greens will not garner any beauty prizes (see below), but they always have me wishing I had been more pigish and made just one more egg’s worth as I dip my tortilla in the remaining juices. Chipotle egg tacos with greens and Israeli feta. Heat the olive oil on medium in a frying pan and cook the chopped greens, covered for about 5 minutes, stirring once or twice. 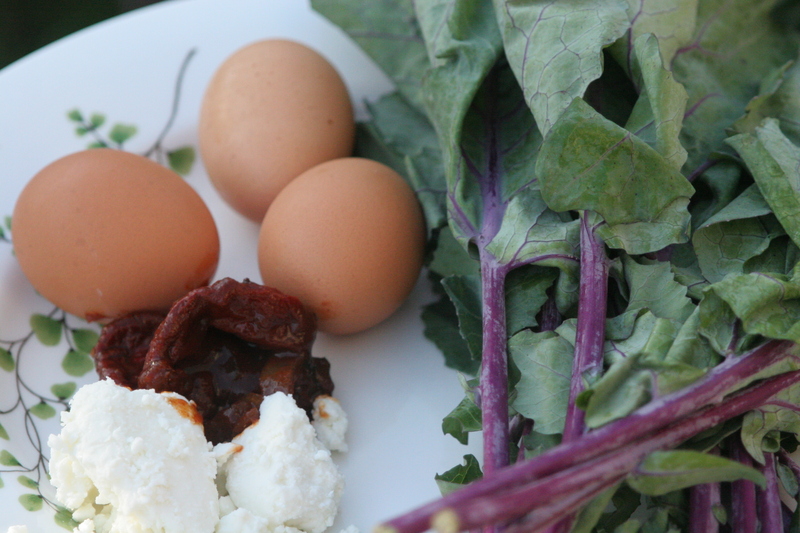 Meanwhile, whisk together the eggs, chopped chipotle peppers, and Israeli feta in a medium bowl. When the greens have just barely cooked and remain a vibrant green, remove them from the pan and set aside. Cook the scrambled egg mixture in the same pan (you are welcome to add another teaspoon of olive oil if necessary before adding the eggs), stirring with a heat proof spoon or spatula for the first minute and then flipping the mass mixture for the final cooking time. When the eggs are just cooked and the feta is still slightly wet and melted you are done. Serve on warm tortillas with the greens. 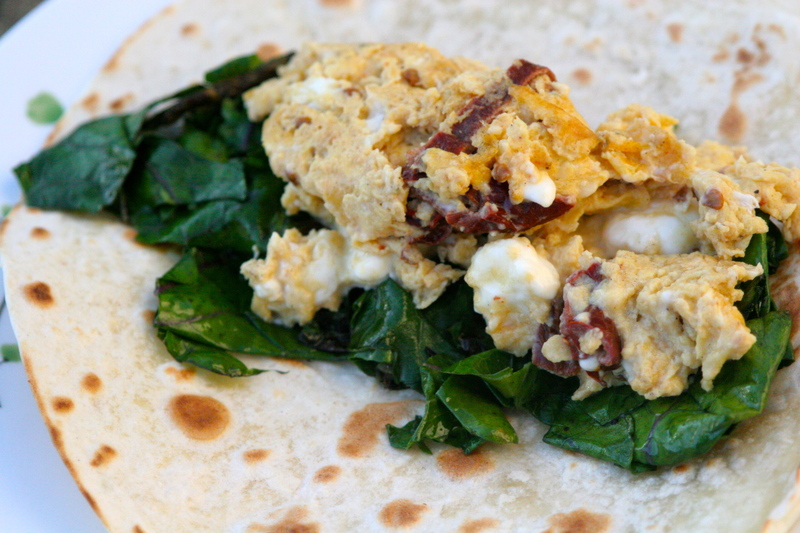 This entry was posted in Breakfast, Dinner and tagged Chipotle egg recipes, chipotle eggs greens feta, easy egg dinner breakfast lunch, egg chipotle taco fifteen minutes. Bookmark the permalink. You really can’t go wrong with these ingredients, can you? I think my mother and grandmother have made any number of variations on the egg-feta-pepper dish over the years, sans the tacos; basically, whatever is available and in season works. I think parsley or dill or paprika are common additions to that sort of thing. This post, like a few others before it, has a particular tone of soulfulness that really makes me wish we woke up in your house every morning. Lovely. I agree, and speaking of which, have you ever tried Shakshuka? It is an Israeli egg based dish with a rich tomato sauce around just-set eggs. DELICIOUS! Does your mom cook the eggs scrambled or frittata style? My Armenian friend says they always do it frittata style with dill and feta. Thanks, CC, for introducing me to this combo of amazing flavors — and for giving us all another tasty yet manageable dish. Eat up and enjoy, everyone! Oh, you hyperbolic sweet friend! You are too nice. How did yours turn out?